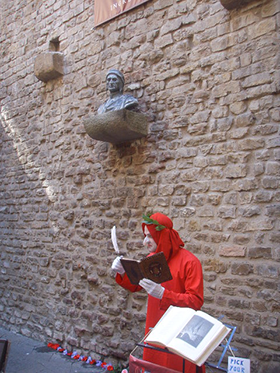 A Dante “living statue,” standing before the reproduction of Dante’s house. Photo courtesy of Don Larsson. A pig, a puppet, a real boy or two—turn any corner in Florence, Italy and you may encounter a literary ghost. The tourist industry as much as local civic pride reminds strollers that world-famous stories were born here. 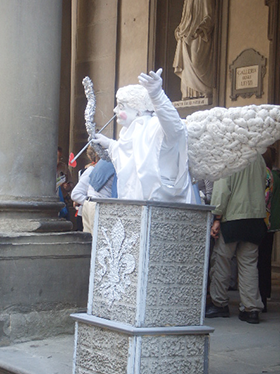 Living “statues” of the poet Dante Alighieri, whose 14th century Divine Comedy charted heaven and hell, stand motionless. Drop some coins into a nearby basket, and Dante “himself” will begin to write, wave, or nod graciously. Yet Dante’s Inferno is not the only hellish vision inspired by Florence. Two dark masterpieces of children’s literature have sprung from its sunny streets and surrounding, lush countryside. I learned about one work and became better acquainted with the other during my trip to Italy in May, 2012. Hans Christian Andersen (1805 – 1875), one of Denmark’s literary giants, spent more than nine years in other countries, two of them in Italy. Best known for his fairy tales, Andersen also wrote plays, travel books, and novels, one set in Italy. The moody man felt that “in Italy the moon gives as bright a light as on a dark winter’s day in the north.” In particular, Andersen declared in one tale, “the city of Florence is a complete picture book, if only you turn the leaves.” This fairy tale titled “The Metal Pig” is not among the thirty or so best-known, frequently-anthologized Andersen pieces. I had never read it. Then I encountered the Florence landmark that inspired this dark gem. The author, Natalie Rosinsky, in front of Porcellino. Photo courtesy Don Larsson. A life-sized bronze boar, the statue known as the “Porcellino” (or “Piglet”) sits patiently atop a small fountain, next to an outdoor market in central Florence. This Porcellino is a modern replica of the realistic masterpiece, now preserved in a local museum, that had occupied this spot since the 1640s. That is when the Medici Grand Duchy commissioned its official court sculptor to create this public work. Supposedly, by rubbing the statue’s snout and dropping a coin into its watery base, visitors will be lucky enough to return another time to Florence. A nearby plaque explains this superstition and the statue’s connection to an Anderson tale. Porcellino’s shining snout and scattering of coins evoke hope, playfulness, and a generosity born of material comfort. But, as I learned after an Internet search to identify and find the Andersen story, “The Metal Pig” conveys a broader and overall darker range of human emotions and experience. Yet some of this tale’s characters lack this excuse for being callous. A prosperous glove-maker and his wife shelter the abused boy, planning to make him an apprentice. They cast him out, however, when they mistakenly believe he has harmed their pampered, tiny dog. They will not listen to the boy. He again despairs, wandering alone and afraid. Rescued next by a street artist, the beggar boy himself grows up to be a painter. The tale’s final scene is set in a Florence art gallery. On display are two works by the former beggar—a small painting of a happy little boy with the glovemakers’ dog and a large, beautiful painting of a “handsome ragged boy” asleep next to the Porcellino. A “black ribbon” and “long black streamers” adorn the larger gilt frame because the successful artist, still a young man, “had just died!” That announcement is the last line of Andersen’s Florentine tale. Jack Zipes points out that the former beggar has used the “power of art” to change his life for the better. Zipes maintains that hope outweighs despair in this tale. I, though, cannot escape that final image of early death. Nor can I forget the callous indifference of the story’s dog-doting glovemakers and other well-off Florentine citizens. Their blind eye to human suffering is an ironic contrast to the beggar boy’s joy in art, the childhood innocence that magically animates a metal pig. While in Florence, I saw many of the statues and paintings that uplift Andersen’s protagonist, but I still feel distanced from this tale’s supposedly happy ending. I think that the story’s teetering balance between joy and sorrow is itself a fine example of Andersen’s literary legerdemain. Wooden boys outnumber metal pigs, however, in Florence’s shops and souvenir stands. Most often, these puppets wear red shorts, yellow shirt and feathered cap, and a floppy, blue bow tie. They are immediately recognizable as the hero of Walt Disney’s Pinocchio. That 1940 cartoon movie created a world-famous image of this character that outshines all others—even in Florence, the city in which Carlo Collodi (pen name of Carlo Lorenzini, 1826 – 1890) wrote the original children’s classic in 1883. Merchants capitalize on that Disney connection even while they—and we—often ignore the dark complexities of the serialized story Collodi actually wrote. Collodi’s tale of the puppet who wants to be a “real boy” has even spawned a so-called “Pinocchio industry.” The Adventures of Pinocchio has been translated into more than 200 languages. It has led to new adventures set in faraway lands, on desert islands, and even on the Moon! None of these exotic versions or the many board and chapter books based on the Disney film come close to the harsh Tuscan life author Collodi described. The son of poor servants, his boyhood in a rural village introduced him to the hardships of country life. An aristocratic patron paid for the bright youngster’s education, enabling Collodi eventually to become a Florentine translator and author. His newspaper pieces often mocked government officials and high society. The outdoor market where Natalie purchased her Pinocchio prints. Photo courtesy of Don Larsson. An outdoor Florence flea market piqued my interest in the original Pinocchio. One vendor was selling framed prints of its first illustrations by Carlo Chiostri and Enzio Mazzanti, as well as other, early 20th century ones by Attilio Mussino. Such contrasts in tone and style to Disney! Clutching my bargain purchases, I left the flea market determined to learn more about the story they depict versus my childhood’s Disney one, the one now ironically surrounding me in sunny Florence. That research expanded after my return from Italy. Hunger and poverty are two surprising connections I discovered between the original Pinocchio and “The Metal Pig.” Unlike Disney’s Gepetto, who carves a wooden boy out of love, Collodi’s Gepetto creates a puppet from a talking log because he needs income. This Gepetto is afraid of starving in his old age. As he explains, he plans to show-off Pinocchio’s dancing, fencing, and leaping to “earn a crust of bread and a glass of wine.” Nineteenth century Tuscany failed to provide social security for the elderly as well as orphans. Life there was so harsh that children sometimes labored in place of farm animals—and sometimes those animals were worked to death. That is the fate of Pinocchio’s friend Candle-wick (Disney’s Lampwick) transformed into a donkey after his excesses in “Funland.” His is not the only death Collodi depicts. 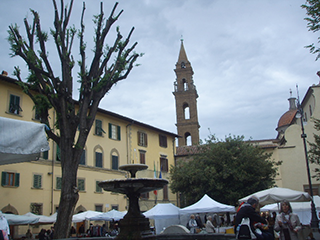 Feeling good is easily achieved while visiting sunny Florence and Tuscany. One may dine on a plentiful Tuscan specialty—wild boar—without ever giving a thought to nineteenth century poverty or today’s depressed Italian economy. The antics of living statues, even Dante’s, may be enjoyed without dwelling upon the terrors of the Inferno. But contemplating this locale is a richer experience when one knows its literary heritage, in particular its complex gifts to children’s literature.